This corn bread is eggless and gluten free which is moist, tender and flavoured with little pieces of sundried tomatoes, jalapenos and spring onions. You can certainly use vegetables of your choice and cheese. This is savoured bread which can be served with soup or smothered with guacamole. Pre-heat the oven at 180deg C, grease a baking dish with oil and keep aside. In a large bowl mix the dry ingredients-corn meal, salt, baking powder. In a medium bowl whisk together buttermilk, honey, oil, vinegar and set aside. Pour the wet ingredients into dry and mix together using large wooden spoon or a firm spatula. Fold in spring onion green, white, jalapenos, sun-dried tomatoes, cheese. 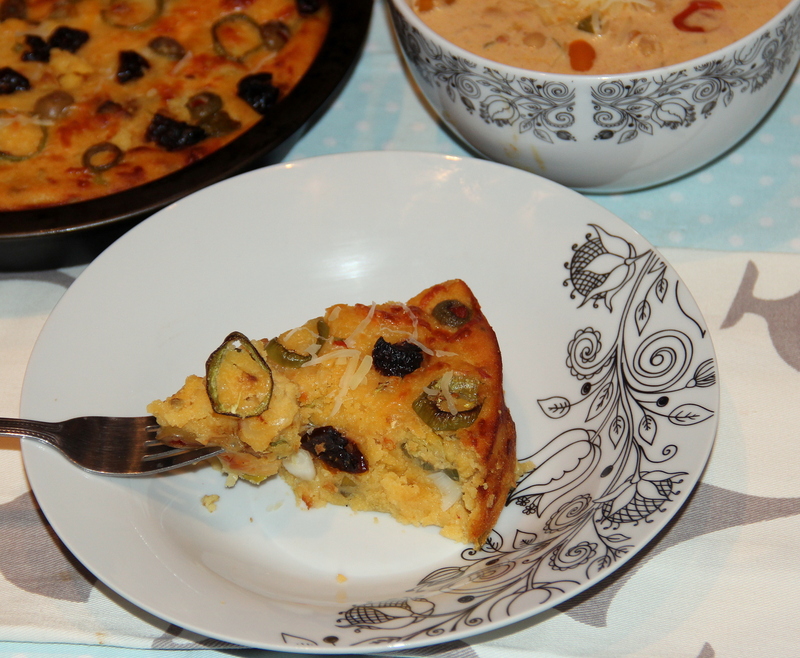 Pour into the greased baking pan and top it with sliced jalapenos, sun-dried tomatoes, olives. bake for 20-25minutes/ until the knife/tooth pick inserted comes out clean. (baking time will vary depending on the moisture and the oven) so just keep cooking until it passes the toothpick test. Let the cornbread cool for at least 30minutes-1hour. As the bread is still cooking from residual heat/ cut into wedges and serve. Sweet corn/ bell peppers can be included for variation. Posted on October 2, 2014, in Breakfast, International, Main Course and tagged Chitras healthy kitchen, drchdietfood, Gluten free recipes. Bookmark the permalink. 47 Comments. This bread looks delicious! I thought it would be great with a cup of soup and it looks like you thought so too. Good day to you Chitra. Yummy Chitra! Nice combination of flavors! Thank you so much dear 🙂 Waiting eagerly for the recipe 🙂 TC! This looks really good – I imagine it’s delicious with some hot soup! This is fabulous Chitra. I am so making it. corn meal is maize flour? Maybe in India its called something else, any idea? hope am not confusing you….. This must be the tastiest cornbread recipe I have seen! It’s great that you are posting GF breads now, you’re so talented. I need to try this one! Yum this look really good! thank you for sharing chitra!